Holds More Photos Than Before! 400 pocket 3-Ring 4x6 Library Collection Photo Album. Holds 3 horizontal and 2 vertical 4x6 prints on each side of page. Availability: Ground orders usually ship in 1-2 business days except Navy Bue (Out of Stock). Add To Cart to view ship rates and delivery dates. 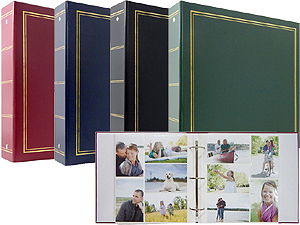 This improved MBI Library Collection 5-up 4x6 bi-directional pocket album now holds even more photos! It features a hard leather-like cover, generous size 2" O-rings and 40 pages to hold up to 400 pictures. Please Note: This album does not come with a dust jacket.